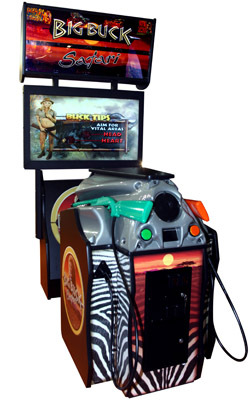 We first saw the latest installment of Big Buck Safari at ATEI this year and we even had some video and a picture or two of the game in action. As this is Raw Thrills’ first release outside of the US, it is already up on Namco Bandai Europe/Brent Sales website and with it comes the flyer for the game. We also have another image of the deluxe cabinet (Twisted took a picture of the DX model at ATEI) in case you can’t get enough. The flyer summarizes up what the game is all about and what new features this title touts over Big Buck Hunter Pro (a few new play modes, different animals, more trophies and it now shows you which critters you blasted). It’s expected that Raw Thrills’ will reveal the US release of the game at ASI in March.